Chewing is a destructive behaviour and can ruin furnishings and clothing in the home. It is important that the issue is addressed as soon as it as noticed, not only for your own possessions, but for the safety of the dog. 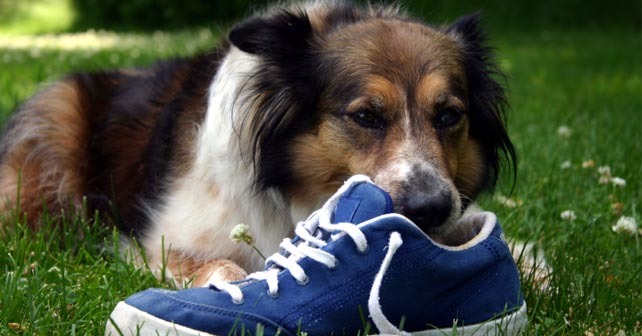 Most items that dogs chew on, will not be made to withstand dogs teeth, and this leads to the danger that your dog could potentially swallow something harmful. It’s always worth checking whether your dog has any dental problems or abnormalities if he suddenly takes up a liking to chewing everything. Check your dog’s gums and teeth for any regular bleeding, swelling or discomfort. If in doubt, always book an appointment to see your vet to have them check it over. All pet stores that carry stock for dogs will have toys designed to take the wear of a dogs jaws safely, without causing injury to the animal. Some have varied textures across the toy, which make it easier for the dog to find the most pleasant part that it wishes to satisfy its urge to chew. When you witness your dog chewing something that you don’t want him to, confiscate the object and scold with a firm ‘No!’. Immediately replace this with his designated chew toy and praise him when he starts to chew the toy. Anti-chew sprays and repellents can be purchased from some vendors, and should be readily available online. Spraying them on suitable surfaces such as the leg of a chair should prevent chewing without damaging or staining the object you’re spraying. Whilst you won’t be able to keep your eyes on your dog all the time, this should relieve the strain and damage on your household furnishings and should eventually eradicate your dog’s chewing indoors.